Seriously reliable suncare. UVA ultra. Durable up to 10 hours. Highly water resistant. Unique lightweight formula. Ideal for the whole family. 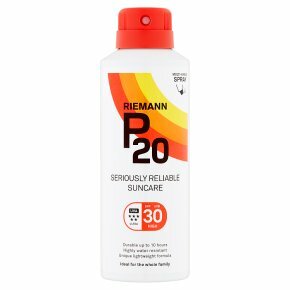 P20 is a highly reliable and very water resistant sunscreen with a unique transparent lightweight consistency. Ideal for the whole family, it contains photostable UVA and UVB filters and is clinically proven to be durable up to 10 hours and that intact protection is maintained even after 4 x 20 minutes in the water. Application: Shake well before use. Spray in short bursts 10-15 cm from the skin. Spray generously and evenly, 15 minutes before sun exposure, to ensure no missed areas and sufficient coverage. Rub in well. Do not spray directly onto face. Spray into hands and apply to face avoiding the eye area. Avoid contact with eyes. After application ensure skin is dry before getting dressed. When applied correctly this can contains 4 full body applications for the average adult. Reducing the amount of sunscreen applied significantly lowers the protection. It may be necessary to re-apply after, for example, extensive sweating and towel drying. The general recommendation for sunscreens is to re-apply frequently to maintain protection.